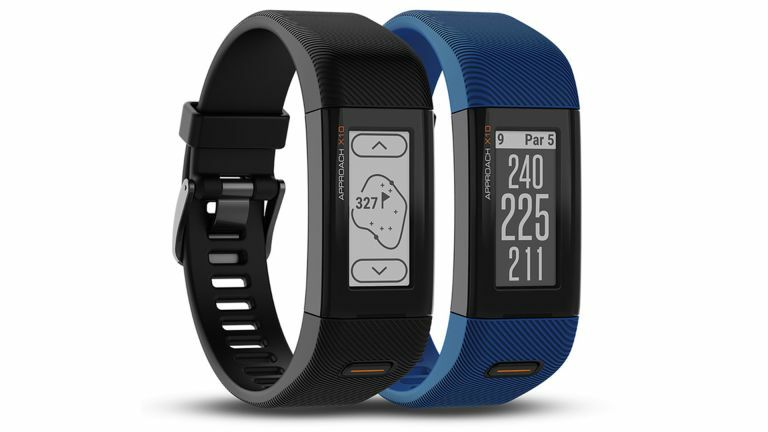 Garmin has taken the wraps of its latest golf wearable in the form of the Approach X10. Unlike other golf wearables this is super small to make sure it adds to your game without affecting your swing. The Garmin Approach X10 in appearance is a lot like a fitness tracker with a wrist-band like design. That means a 1-inch black and white touchscreen but under that is a wealth of smarts and details for over 41,000 golf courses. The X10 is water resistant to 5 ATM, ideal for those wet weather rounds. It also has a claimed battery life of 12 hours, so should last a good 18 holes and beyond before needing a charge. Unlike many activity trackers, the Approach X10 comes with GPS onboard. That means it will be able to offer up useful information like distance to the front, back and middle of a the green, while displaying layups, doglegs and hazards, such as bunkers, for each hole. Then, since it knows exactly where you are, it will switch to new information on the next hole automatically when you arrive at the tee. Other useful information shown off on the X10’s display includes measuring the shot distance. This can be varied to suit the pin location on that day for exact accuracy. The Garmin Approach X10 also works with the Garmin app meaning users can compete with the players on the leaderboard. Think Strava but for golf. Except in this case the app can even be used to set up tournament events where other players are invited to join and compete. The Garmin Approach X10 will be available this month for £160.